Does your life feel like it’s falling apart at times? Maybe even today it seems as if the world is crumbling around you. If so, let’s take a moment to think about the life and living hope that we have because of Jesus, the chief Cornerstone. Because of what Christ did for us on the cross, we’ve been set free from our past, fully and freely forgiven. Now, we’ve been given a life of purpose and significance. In this life, we are no longer alone or isolated or living independently of God. We have been loved unconditionally and accepted into God’s family. Which means we should live without fear of the future because we have this hope in Christ! He is sufficient for every hurt, for every habit, for every challenge and test in life. But we must first choose to build our lives on the Rock. Our Scripture for today reminds us, “For it stands in Scripture: ‘Behold, I am laying in Zion a stone, a cornerstone chosen and precious, and whoever believes in him will not be put to shame’” (1 Peter 2:6). Though rejected by others, if Jesus is the Cornerstone set in your life, there is consistence, strength, and significance. Maybe you are wondering today why your life doesn’t seem to fit together… why things aren’t working out the way you had planned. If you’re trying to build your life without Jesus, the Cornerstone, everything will ultimately fall apart. As the old hymn says, “On Christ, the solid Rock, I stand, all other ground is sinking sand.” Jesus is the solid Rock. So learn to consistently build your life upon Him… not on the things of this world! PRAY AND ASK GOD’S GUIDANCE TODAY FOR THE CHALLENGES IN YOUR LIFE. click here to listen to Dr. Graham's daily broadcast on OnePlace.com. Do the words rested... peaceful... and refreshed describe you today? Or do the words stressed... rushed... and pressured better describe your way of life? If you're like most Christians, you'd probably have to admit those last three words more accurately describe your life most of the time! The good news is that it doesn't have to be this way... even when your life is one big pressure-cooker. 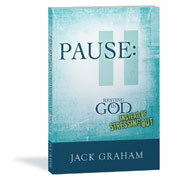 And in my new book, Pause: Resting in God Instead of Stressing Out, I'll show you why. Based on the principles from Paul's letter to the Philippians and Psalm 23, Pause: Resting in God Instead of Stressing Out will help you find true peace and rest in a world that is anything but peaceful and restful. It's the perfect "pause" button you need! Originally published July 14, 2009.